“Noah” The True Bible Epic! I have done some reading on the history of the Great Flood! It’s one of the most fascinating and forever relevant events in The Bible! The directions that this movie can go, are many! From the understanding that man did indeed live along side the dinosaurs to the introduction of knowledge and sexual perversion by the Watchers to the creation of a new seed. Who are those men of renown all you history buffs? Genealogy is the code of the Bible narrative. 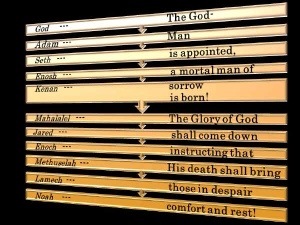 An amazing prophecy emerges when the meanings of all 72 names in the genealogy from Adam to Jesus are read sequentially! We begin with “God” in the genealogy of Jesus just as the Gospel of Luke does. Luke calls Adam, “The son of God”, therefore “God” is the correct starting point in Jesus’ genealogy, (Luke 3:38). The names given to the people described the events just prior to the flood and after! As a Christian I can discern when artistic license is used because I stand on the truth so I don’t fall for just anything! Cecil B DeMille presented many Bible narratives and he even applied some artistic license to his Epic Movies! It was Epic, Spectacular and great way to get people interested in just what The Bible has to say. 1 Corinthians 9:19-23 – I have become all things to all people so that by all possible means I might save some. 23 I do all this for the sake of the gospel, that I may share in its blessings. The movie studio and the National Religious Broadcasters released a joint statement announcing the move, and Paramount placed the following text on its website for the movie. Many Christian bloggers and media sites have offered their take on the upcoming Noah movie from director Darren Aronofsky and Parmount Pictures. According to early screenings and a disclaimer from the movie website, the film is likely to take some creative license with the events of Genesis 6–9. 1. It’s the Year of the ‘Christian Movie’. We’re at the start of a year in which many biblical and Christian stories are coming to the screen. Earlier today in fact I posted Christian Hamaker’s review of Son of God on Crosswalk, an imperfect but fairly well-executed telling of the life of Christ. We’ll also see Heaven is for Real, Exodus, and Mary, with possibilities for Cain & Abel and Pontius Pilate on the horizon. This is an intriguing trend. It may turn out to mean nothing, or it could be the start of another golden age of biblical epics. Those of us who are deeply interested in themes of hope, love, sacrifice, redemption, and forgiveness in film, and who have been disappointed by the quality of many works of ‘Christian art,’ are invested in finding out. 2. The Flood on Film. Imagine what today’s special effects wizards can do to make a global flood look convincing. How will they depict the concept of rain in a world that possibly has never seen it? What will the springs of the earth look like? How loud will it be, both within the ark and without? What will Noah see as the waters subside? 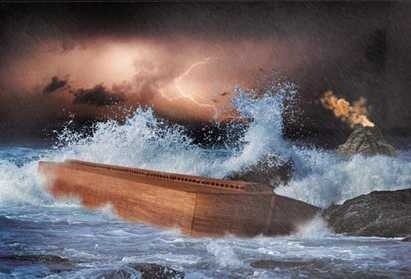 Will we get any rationale to explain the ark not having been found (unless of course it has been)? This all has potential to be very cool. If the sights and sounds are resonant, accurate, and memorable enough, the film has promise to enhance our readings of Genesis the way a trip to the Holy Land informs our understanding of the gospels. Previous Even a broken clock is right twice a day Next America is Amazing But Not Sarah Palin! Jesus spoke far ahead of his time relating to us what life would just prior to his coming. He says in Matt. 24:37-38: “But as the days of Noah were, so also will the coming of the Son of Man be. “For as in the days before the flood, they were eating and drinking, marrying and giving in marriage, until the day that Noah entered the ark,” (Gen.6-7). I don’t see how any movie can be a threat to anyone’s beliefs. When I don’t like a movie, I head for the exit door. A women gets stabbed in an opera, then she sings for twenty minutes. It may be heart stopping, beautiful but how realistic is it? Who cares? If you can’t suspend disbelief in an opera house, don’t go to the opera. You don’t belong there. The same applies to movies.